That's just what we need more douche' bags flying in between cars up to 49 miles on a single charge. 20k and it still has peddles. Heck I only paid 14k for my first house! How many barristas paying $20 - 25K for an electric bicycle? I'll be posting plans on how to build your own shortly. 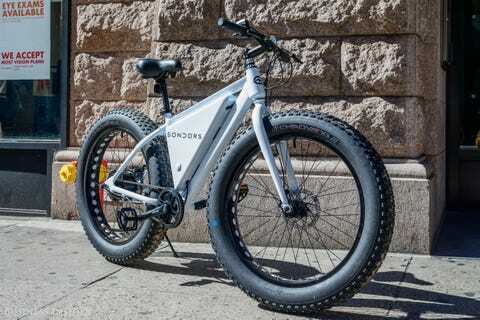 Sondors e-bike $500 (base) + $200 (delivery). Here's what e bikes are good for....gettin' through city traffic like a hot knife goin' through butter. Rear view from one of these bikes leavin' everyone in its dust. https://electricbikereview.com/mousta... The Moustache Lundi 26 is a stylized step-thru with a high-end drive system from Bosch at a very reasonable price point, optional NuVinci CVT or Shimano Di2 drivetrain upgrades improve shifting. Moustache is a French company that has been around for several years in Europe, the Lundi is their flagship model available in several colors and one "fits most" frame size. Awesome utilitarian accessories including tubular fenders, an Aluminum coated chain cover, AXA cafe lock, basic seat post suspension, integrated LED lights and sturdy rear rack. The frame is rigid, there's no suspension fork and the seat post shock isn't great, unique handle bars make mounting your own accessories difficult, no bottle cage bosses on the seat tube. https://electricbikereview.com/benno/... The Benno Boost E 10D is a compact cargo-style electric bike with sturdy 24" wheels, comfortable 2.6" diameter tires and a premium drive system from Bosch. Low balanced weight distribution, removable battery and display panel, premium integrated lights by Supernova, Micro USB charging ports and three color choices. Solid 10-speed drivetrain from Shimano, the motor offers shift detection for reduced wear on the chain and sprockets, powerful hydraulic disc brakes also from Shimano. No suspension elements, currently only available in one frame size, new to the US and possibly harder to locate at dealers for test rides, solid one year warranty. This is what I'd like to tinker with = compressed air powered bikes (stop every 20-50 miles & refill the air tank at a gas station... Used to be that compressed air was free - still is in Europe). While being fitted for the Specialized Turbo Levo I got to pick Erik’s brain about the differences between normal bikes and electric bikes. He helped me to address the myths and rumors about ebike performance and forecast the space. Erik has participated in Specialized Bicycle University (SBU) and earned multiple certifications (including Level 1 Fitting). He worked for Peloton Cycles in Fort Collins, Colorado when this interview took place. - Drivetrain Care: always make sure it’s lubed and cleaned, if you crash it’s important to go to a local bike shop for a tuneup and checkup. This is especially important for mid-drive ebikes if you crash on the drivetrain side. If your ebike doesn’t have a kickstand (as many electric mountain bikes do no) gently lay it down on the non-drive side. - Disc Brakes: they aren’t as difficult to work with or expensive as some people think, they don’t require as frequent tuneups because alignment stays and there’s no cable stretch. Don’t pump the brake levers if the wheel is off, the disc rotor should be in there. - Full Suspension: you can actually climb better with suspension at times even though it seems like “wasted energy” if it’s setup properly with sag, the new valving technology improves your traction and you get better comfort. - Suspension Lockout: you don’t need a solid true lock, a bit of give and movement can be good and reduce damage on parts and valves. - Tubeless: there are many benefits to going tubeless these days (reduced weight, no snake-bite flat tires, can run at lower tire pressure), this is a big benefit for plus sized tires which pops tubes a lot with lower PSI. Reduce weight, improve control and also improve braking. - Electric Assist: doesn’t spin out and wreck trails, it does have a soul and allow people to go further and ride if they have an injury, you’re not accelerating hard or slipping tires… you can still skid on an ebike or regular and that causes the most damage (along with riding in mud). https://electricbikereview.com/elby/c... The Elby City 9-Speed is a highly polished, purpose-built electric bicycle with easy-to-mount frame, adjustable bars and ergonomic touch points, available in five colors, additional $99 shipping with assembly by Velofix. Custome extra-wide Aluminum fender that don't rattle, integrated Supernova LED lights with a custom light blade up front, large hydraulic disc brakes, internally routed cables. Available in a single speed or nine speed configuration, BionX D-Series motor is an excellent climber and near silent, throttle on demand and torque sensing assist, removable color LCD and USB charger for phone with optional Bluetooth app. Regen and motor cutoff switch is only built into the right brake lever, the bike is well balanced and surprisingly stiff for a wave frame, higher price tag here but you get nicer parts and a great warranty. https://electricbikereview.com/moar-e... The MOAR 24/7 is an entry-level full suspension fat tire electric bike with unique battery rack design, adjustable integrated headlights, two backlights, turn signals and electronic horn, you also get a USB port on the display for your own accessories. Between the lower PSI rating on the tires and basic suspension systems, the bike is comfortable to ride over bumps, one trade-off is increased frame flex and wobble at higher speeds. Available in two colors, sold worldwide through Indiegogo with $195+ for shipping, one-year parts warranty (where they send you fixes), multi-speed drivetrain and nicer brake levers. I feel like the brakes would work better if they were larger and hydraulic, especially given the ~75 lb weight, plastic chainring guide is vulnerable when folded, twist throttle is always live (good for advanced users but a hazard when folding if bike is left on). It looks like a micro-car. It rides like an electric-assist bike. The ELF (“electric, light, fun”) is a solar car-bike hybrid that will keep you out of the rain, or from breaking a sweat, and perhaps convince you to jettison your car for all those trips around town (and to get into shape while you’re at it). Today, the ELF is a 160 pound (72.5kg) vehicle that can carry up to two adults (or an adult plus 2 children) or an adult plus 500+ lbs (226 kg) of cargo (there’s space in back for a dozen bags of groceries. Starting at $7,000, it’s classified as a 'bicycle' by US law so it can't legally go faster than 20 mph on just electric power (though pedaling and hills will speed things up). With a lithium-ion battery and mid-motor drive, it has a range of 48 miles per charge (and further if you pedal). The rooftop solar panel will recharge the battery with 7 to 8 hours of sun or the battery can be removed and plugged into a wall for a 2.5 hour charge. ^^^ I like the ELF, but $7k for 160lbs of ELF stuff is tough to swallow. Also wonder how long it'd take the local control freak "authorities" to restrict their use if they went anything akin to mainstream. https://electricbikereview.com/bulls/... The BULLS E-Stream EVO 45 FS is a high quality full suspension e-mountain bike that's also a speed pedelec (capable of 28 mph top speeds), solid hydraulic disc brakes, wide thru-axles with Boost Technology. Adjustable 150 mm RockShox suspension front and rear, four-bar rear swing arm to reduce brake jack, 22 speed drivetrain with Shimano Deore XT Shadow Plus clutch on rear derailleur to reduce bounce and slap. Integrated LED lights with a bright mode at the rear when brake levers are pulled, room for a bottle cage or other accessory on the downtube, beautifully integrated battery and motor. A bit heavier than competing FS models due to battery size (37v 17.5ah), not a fan of the spring loaded kickstand, battery port cover doesn't always stay down, battery lock can be wonky and is placed in the path of the left crank arm. https://electricbikereview.com/juiced... Juiced Bikes has updated their CrossCurrent electric bike offering to include three frame sizes in diamond high-step configuration and now a mid-step diamond which they call the step-thru. Priced at $1,499 including a one year battery warranty, two years on components and lifetime on the frame… this a cheaper ebike offering a lot of value. You get hydraulic disc brakes with 180 mm rotors, locking grips, even a bottle cage boss setup on the seat tube in addition to rack bosses at the rear and fender holes. It delivers a nine speed Shimano Alivio drivetrain and comes with a unique TMM4 torque and cadence sensore. I found that the ebike felt more nimble than some others given the mid-frame battery and smaller internally geared 350 watt hub motor. On hand for this review was the founder of Juiced Bikes, Tora Harris, who walked me through some of the more technical aspects of the bike. I love that it comes with a suspension fork and upgraded Selle Royal gel saddle because you tend to feel bumps at higher speed and they also offer a battery upgrade so you might be riding further. Ultimately, this is a stand-out electric bike that has been generating a lot of excitement in the space. Bringing younger riders with limited budgets and a desire for sporty speed performance in as commuters. https://electricbikereview.com/giant/... The Giant Road-E+ is an aggressive road bike with 28 mph top electric-assisted speed, drop bars and sport saddle, you get Shimano Ultegra rear and 105 front derailleurs with 22 gear combinations to work with. Shimano hydraulic disc brakes offer powerful stops and tend to stay cleaner than rim brakes, all-Aluminum frame is lightweight and sturdy but doesn't absorb vibrations as well as Steel or Carbon fiber. Available in four frame sizes for better fit, sold through Giant dealers worldwide so you can get setup right and rely on knowledgeable technicians for tuneups and any warranty support. The Yamaha mid-drive system is relatively quiet but still very powerful, it doesn't provide as wide an RPM range so I find myself pedaling slower than I'd like at times, LCD display is not removable. https://electricbikereview.com/motiv/... The Motiv Sleek is a stylish electric cruiser available in several unique colors (metallics and matte finishes), mid-step frame is easier to mount but feels solid, simplistic and easy to work on. Long swept back handlebar and oversized comfort saddle give this ebike a relaxed ride quality, balloon tires with go-anywhere tread let you explore packed-dirt paths. Mid-mount battery keeps weight low and centered, available in a range of sizes targeting range and power or lower price and lighter weight, zippy motor with assist and throttle operation. No fenders, rack or lights but you could add your own... less refined than some competing models from larger companies but also easier to repair and upgrade. In this way, it tends to be reliable. I got to spend some time with the President of Raleigh Electric discussing ebikes recently and he spoke to me about battery care. I thought the points he made were super interesting… specifically avoiding hot environments, charging regularly and the way that batteries are setup with a battery management system… that can all have an impact on how reliable and long lasting the pack will be. If you’ve got an electric bicycle and want to maximize the life of the battery follow these important tips from an expert. Also, be careful with your battery because there have been fires due to batteries (even with the small cell phone batteries as we saw with the Samsun Note S6 I believe). https://electricbikereview.com/espin/... The Espin Flow and Sport are value priced speed pedelecs with assistance up to 25 mph, eight-speed Shimano Altus drivetrain, 160 mm mechanical disc brakes with motor inhibitors. Reflective tires and integrated headlight increase the visual footprint and are a big deal on the all-black color, they also offer an all-white option. Swept back handlebar, adjustable stem, ergonomic locking grips, basic suspension fork and upgraded Selle Royale saddle improve comfort and fit. Battery cannot be charged on-frame which increases risk of drops and requires extra time, very basic four-magnet cadence sensor, some frame flex and speed wobble on the step-thru frame. https://electricbikereview.com/easy-m... The Easy Motion Evo Big Bud Pro is an all-wheel drive electric fat bike with adjustable drive modes (rear, front or both with traction control), beautifully integrated battery and compact motors blend in making it stealth. Upgraded quick release and thru-axle design makes the rear wheel easier to remove and the bike more serviceable, angled top-tube lowers stand over height making the bike comfortable to mount. Beautiful compact display that's removable for safe storage, 16-speed drivetrain helps you move the heavier ~65 lb bike assisted or otherwise, good network of dealers and a solid 2-year warranty. Only available in one frame size and one color scheme, battery can be charged on or off the frame but requires a dongle adapter that could get lost, battery casing is easy to scratch and white underneath. https://electricbikereview.com/izip/e... The IZIP E3 Peak DS is a value-driven full suspension electric cross country mountain bike with higher end drive system and components from Bosch, SRAM and RockShox, it's $300 cheaper than prior year with lots of upgrades. Beautiful hydroformed frame with inset battery mount and tapered head tube, the motor hangs down a little compared to some other designs I've seen with the Bosch motor but I love the alloy skid plate. Large grippy pedals performed well compared to the standard cages I see a lot and wouldn't need replacing, stiff thru-axles on both wheels with quick release, large hydraulic disc brakes with adjustable levers. Unique rear suspension design felt stiffer to me, white fork doesn't seem to match the rest of the frame and wasn't my favorite look, solid two-year warranty with a decent dealer network in the USA. https://electricbikereview.com/giant/... The Giant Quick-E+ is a highly-polished electric city bike with sleek battery integration, full-protection fenders, premium LED lights running off the main battery and a minimalist pannier rack for hauling gear. Available in four frame sizes but only one traditional high-step diamond style, the bike is extremely efficient with a rigid alloy fork and slick hybrid tires, 20 speed Shimano Deore drivetrain. The Yamaha motor is extremely quiet but offers some of the highest torque output, this is a speed model that can reach 28 mph assisted, beautiful display and button pad with USB charging port for portable electronics. The display is not removable, the battery can be charged on or off the bike but is heavier and doesn't have a handle so be careful, great price and leading warranty with lots of dealers offering good support. https://electricbikereview.com/magnum... The Magnum Classic is a cheap but fairly nice folding electric bike. It's a feature-packed folder with lots of accessories and multiple color options, great price point and warranty, available through dealers or the Magnum online store. Sturdy folding mechanisms with security locks emphasize safety, reflective tires and LED lights keep you seen in dark riding conditions, alloy chain guide and derailleur guard protect the drivetrain. Adjustable handlebar and seat height accommodate tall or short riders and the suspension fork and suspension seat post, while basic, make it comfortable to ride. At nearly 53 lbs it's heavy for a folding ebike, independent lights are more of a hassle and can be left on accidentally then run out, key must be left in to ride, battery is heavy and not hidden. https://electricbikereview.com/giant/... The Giant Dirt-E+ 1 is a full suspension electric mountain bike with capable hardware, excellent dealer support and impressive range, four frame sizes accommodate a range of riders, impressive pricepoint. 22-speed drivetrain with Shimano Deore XT Shadow Plus allows you to engage a clutch to tighten the chain and bolster shifting (important given the 80 Nm peak motor torque rating). Custom battery pack design fits neatly into the downtube but can be charged on or off the frame, compact display and button pad were large enough to read and press but stayed out of the way. Stiff thru-axles with boost hubs (longer than normal) support 2.6" tires, tapered head tube and ebike specific suspension from Fox is stiff, Maestro suspension design improves stopping and reduces bob. I was riding my Yamaha to the gym yesterday along my usual route and as I turned onto a main street I saw another guy pushing his e-bike on the sidewalk because it suddenly died. He gave me "that look" like he should have a real motorcycle instead. https://electricbikereview.com/raleig... The Raleigh Superbe iE is a vintage-styled electric bicycle with beautiful alloy paint-matched fenders, rack and chain cover, you get several frame size choices and two styles (high-step and step-thru). Lots of little upgrades and accessories like an alloy chain guide to keep the chain on track, mini-USB port on the control pad for charging accessories and a triple bungee for the rack. Clean simple cockpit, small quiet motor (with impressive zip for it's size) and the rack-mounted battery don't attract attention... especially if you put panniers on the rack. Rear heavy design impacts handling and causes some frame flex, two-step power on process can be annoying, wired for lights but not included and no reflective paint on tires. While visiting Greenpath Electric Bikes in Brooklyn, New York I met a gentleman named Mark who had purchased one of the Sondors fat tire electric bikes and proceeded to outfit it with gear and accessories for his commute in the city. Mark has increased the range of the bike by adding larger batteries and he got help from the two local shops, Greenpath and Propel. His pannier bags contain different batteries (one 36 volt and one 48 volt configuration). His bike has custom yellow accents to help motorists see him and he wears a cool motorcycle helmet as he cruises around. Mark has owned the Sondors since its first release in 2015 and it’s still running strong. He added a Cycle Analyst ebike display from Grin Technologies, this panel improves control over the two batteries and to adjust speed. He uses vinyl to create yellow accents on his black bike and purchased the fabric from a shop in Times Square. He’s working on some custom wiring to keep the bike looking clean and said the bike has had no issues riding in the rain or snow! Even water and sand at the beach. He crosses the Brookly Bridge and Williamsberg Bridge regularly. I was particularly impressed with Mark’s front rack because the Sondors did not come setup for that initially, it’s another custom job. Mark said he’s 5’9” and weighs about 240 lbs and the standard 350 watt motor has held up great. Apparently he usually rides around with speakers and a JBL setup so he can have a good time at block parties! In this video I go over my build and experience over 10,000 miles commuting by ebike. This video is a detailed overview of how to convert a bicycle to an electric bike (Ebike). Including upgrading the brakes, installing the universal brake cutoff kit, shift sensor, aligning the chain, and riding like an idiot. The motor in this demonstration is a 1000W Bafang 8Fun BBSHD Mid drive system with a 48v 10AH lithium Ion battery pack. The process is the same for any Bafang mid drive, including the BBS01, or BBS02 with a few additions. Happy riding. Purpose built eBikes are great, but expensive, and the mid drives are also generally 36v 350w systems without a throttle. This motor and battery can be had for a little more than one thousand dollars and installed on almost any existing bike. Plus you can configure it's limits and make your rides as easy or tough as you want, this is great for commuting or just exercising. When you let it assist you, it makes you feel incredibly strong, and it will get you out and enjoying riding. The Turbo Vado has been exciting people for the past year with posts in the EBR forums and questions via email. Today, April 23rd 2017, Specialized updated their official website with three Vado models including the 5.0 and a Men’s and Women’s 3.0 (high-step and step-thru). The bikes appear to use a custom programmed Brose mid-drive motor system operating at 350 watts and 250 watts with top speeds of 28 mph and 20 mph respectively. The price difference between the models is $2,000 with the Vado 5.0 coming in at $5k. This model only comes in high-step and one color (black and grey) but appears to have a touch screen interface with GPS and elevation tracking. Both models can connect to the Specialized Mission Control App for Android or iOS to fine tune motor performance and plan trips according to battery capacity. You can see the two models compared side by side back at ElectricBikeReview.com using the compare tool: https://electricbikereview.com/compar... but the primary differences I saw when studying the official website and manual include: larger battery, higher motor wattage, higher top speed, brighter headlight 12 volt 2 led 600 lumen vs 6 volt 1 led 300 lumen, rigid alloy fork vs. suspension fork, fatter tires (51 vs 47 mm), larger front chainring (48 vs. 40t) and wider cassette range 11-42 vs. 11-40, upgraded drivetrain from deore shadow plus to deore xt shadow plus, nicer handlebar, nicer grips and a nicer saddle. This is just a preview, I welcome any feedback and corrections. My goal was to make it simple and quick to understand the Vado and determine which model might suit your budget and lifestyle if you are interested in a sporty commuter or touring / trekking bike.